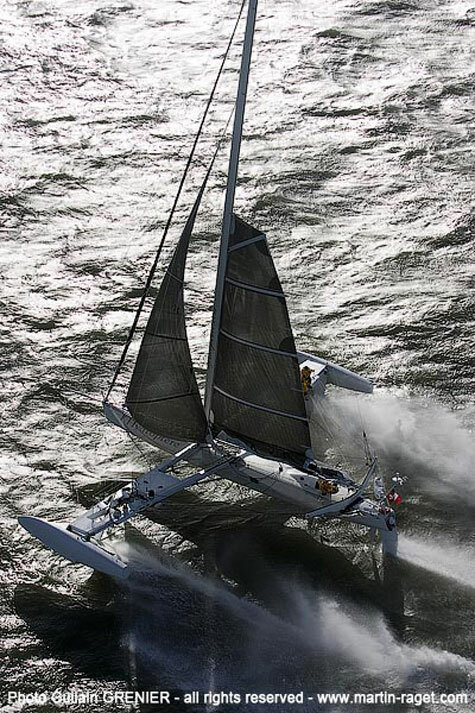 The 60-foot Hydroptere sailing yacht can’t fly high above the water but, it can rise up and glide over waves instead of running through them allowing it to reach mind-boggling speeds. 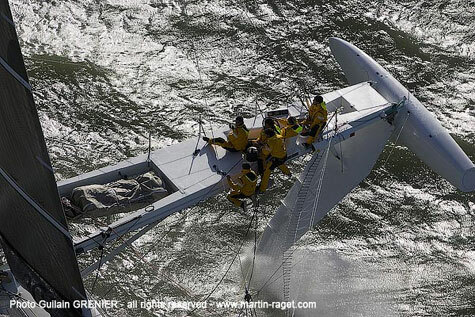 When the wind is at swift speeds, the carbon fiber ailerons stay in contact with the water while the rest of the boat flies over the waves. 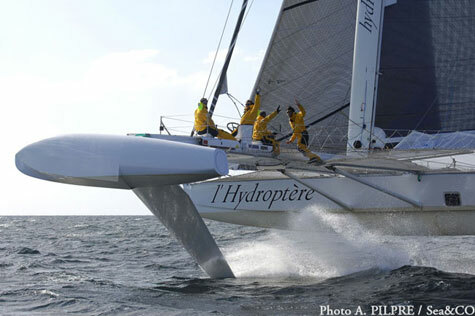 Hydroptère has already crossed the Channel in just over half an hour. 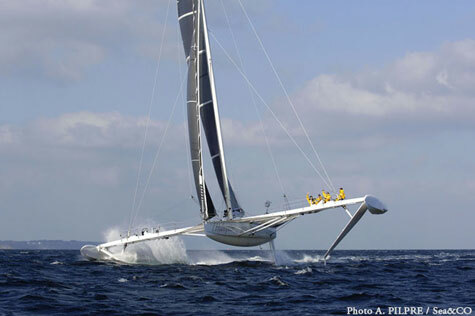 The yacht also has two world records in her booty, the 41.69 knots (48mph) over a distance of one mile, and 44.81 knots (51mph) over 500 meters. 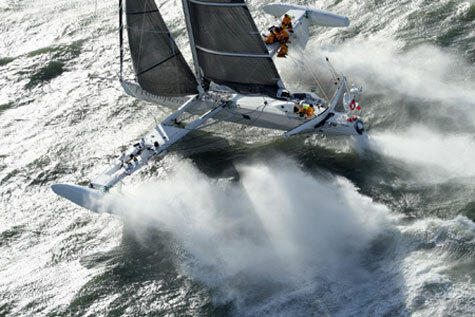 Alain Thébault, the brain behind the speedy yacht, hopes to achieve the 50 knot mark this winter. The principle : A measurement system on board allows the sailors to know at the real time the values of the stresses exercised on all the strategic points of the boat. During each departure, a trial engineer, Jean Abribat, runs the whole acquisition chain. Then, he carries out a complete analysis of the records for a better understanding and anticipation of the restrains of the boat according to the different states of the sea, the wind and the sails. Some visual and noise effects instantly notify them of the applied strengths and they can react accordingly. In addition to the knowledge of the in situ values, these fittings also aim at analysing afterwards the recorded data in order to compare them with the estimates of the simulator. The Hydroptère engineers will then be able to integrate the recorded data in the simulator in order to get the best projection of the theoretical behavior to plan the understanding of the real and to anticipate. That system helps the recording of the data issued from the whole set of sensors and it reproduces the environmental context of the measure. It requires two measurement chains connected to a computer provided with a software for acquiring and handling the data, MAGALI designed by EURILOGIC. - The tonnage bridges mainly measure the local stresses that help to deduct the efforts sustained by the equipped elements.